One of my lifelong interests has been photography. I spend almost as much time with it as I do with pottery. 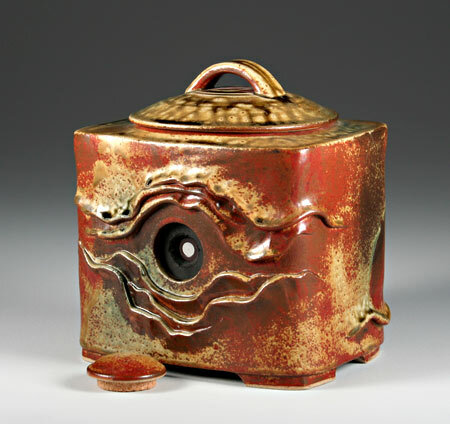 It only seems natural that the two passions should come together, and these ceramic cameras are the result. These are fully functional pinhole cameras. They have no lens, light meter, viewfinder, or automatic shutter, and yet they can produce gallery quality images. I use black and white photo paper in them for the negatives. The negatives are either 4 x 5 inches, or 5 x 8 inches. Pinhole camera photography offers creative possibilities that can't be duplicated with high tech cameras. There is the added satisfaction of making your own camera from scratch. I have a separate website that is just about my pinhole camera photography. As well, I have a step by step section that shows how to make a ceramic camera. My cameras are available for sale through the Jonathon Bancroft-Snell Gallery in London, Ontario. The main body of this camera was thrown on the wheel. It was completed in 2017, made of stoneware, and fired to cone 10 (roughly 1,300 deg. C) with a black glaze on the outside, and a matte black glaze on the inside as well. I did a post firing application of 23K gold leaf. The camera uses a 5 x 8 inch photo paper negative, and overall it stands about 35 cm tall. The disk near the base serves as the shutter. This camera was made using a combination of throwing and hand building techniques. 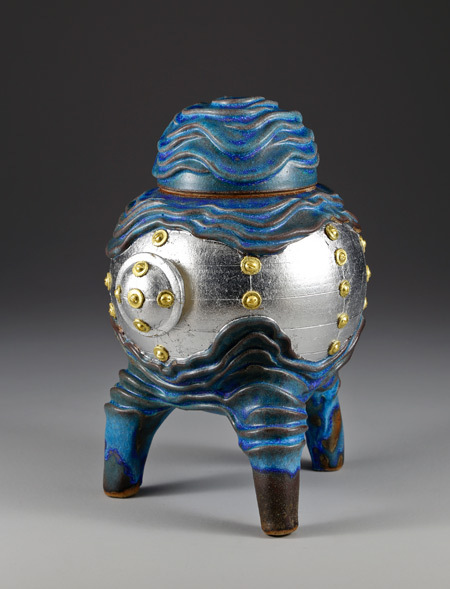 It was completed in 2013, made of stoneware, and fired to cone 10 with a copper blue glaze on the outside, and a matte black glaze on the inside. Aluminum leaf, and 24K gold leaf were added after the camera came out of the kiln. The camera uses a 4 x 5 inch photo paper negative, and overall it stands about 33 cm tall. The disk on the front left serves as the shutter. Here is a test image of a rural road made with this camera. This camera was made using a combination of throwing and hand building techniques. 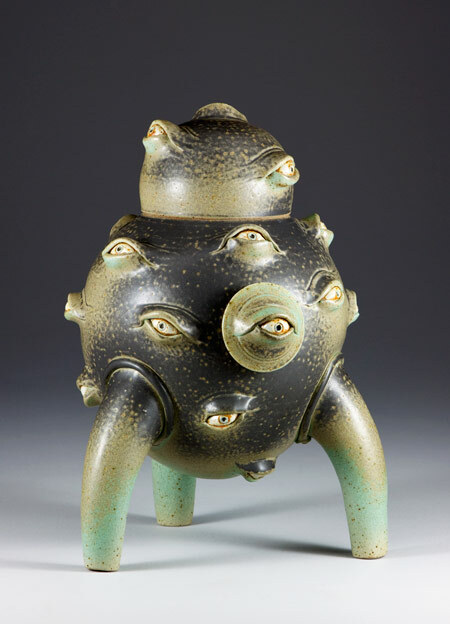 It was completed in 2013, made of stoneware, and fired to cone 10 with a bronzy glaze on the outside, and a matte black glaze on the inside. 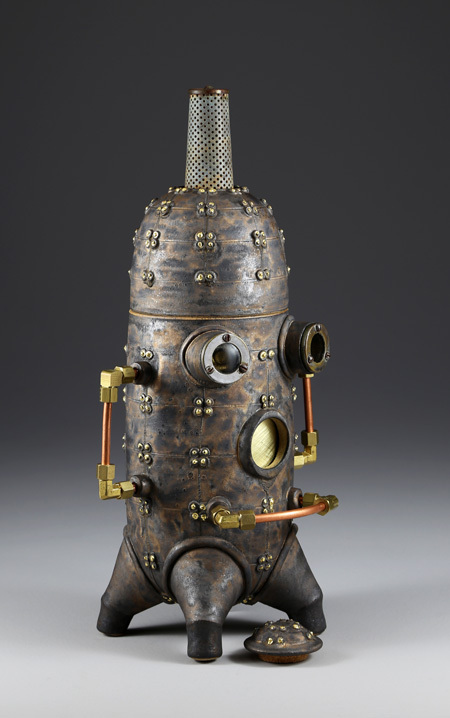 Copper tubing, brass fittings, and 24K gold leaf were added, plus some parts from an antique anaesthetic machine, and the foot valve of a water well. The camera uses a 5 x 8 inch photo paper negative, and overall it stands about 43 cm tall. The disk near the base serves as the shutter. Here is a test image of an antique typewriter made with this camera. This camera was made using a combination of throwing and hand built techniques. 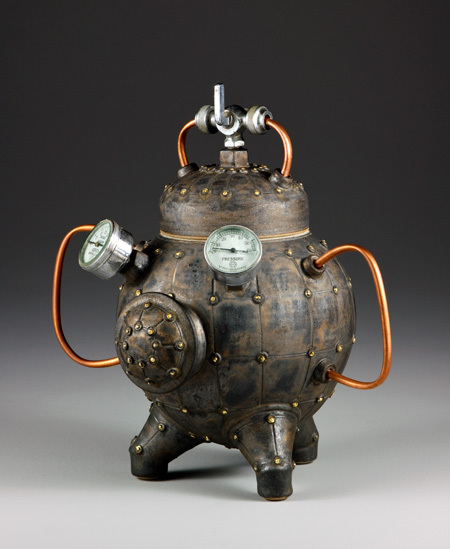 It was completed in 2013, made of stoneware, and fired to cone 10 with a matte copper glaze on the outside, and a matte black glaze on the inside. The camera uses a 4 x 5 inch photo paper negative, and overall it stands about 33 cm tall. The disk on the front serves as the shutter. Here is a test image made with this camera. This camera incorporates a steel cylinder in the middle section. 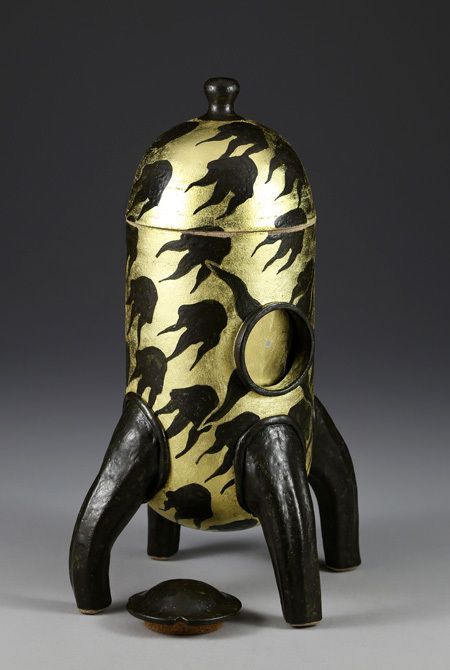 It was completed in 2012, made of stoneware, fired to cone 10, with a bronzy glaze on the outside, plus a post firing addition of 24K gold leaf. A matte black glaze has been used on the inside. The camera uses a 4 x 5 inch photo paper negative, and overall it stands about 46 cm tall. The metal panel on the front held in place with magnets serves as the shutter. 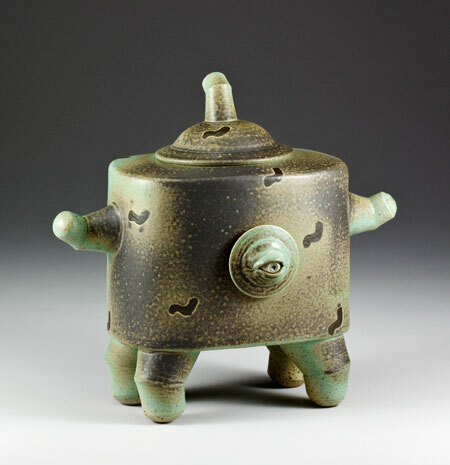 Here is a test image of tea ceremony ware made with this camera. This camera was completed in 2012. It's made of stoneware, fired to cone 10, with a bronzy glaze on the outside, plus a post firing addition of 24K gold leaf. A matte black glaze has been used on the inside. The camera uses a 4 x 5 inch photo paper negative, and overall it stands about 34 cm tall. The disk on the front serves as the shutter. Here is a test image of a beaver skull made with this camera. This camera was completed in 2012. It's made of stoneware, fired to cone 10, with a bronzy glaze on the outside, plus a post firing addition of 24K gold leaf, and found objects. A matte black glaze has been used on the inside. The camera uses a 4 x 5 inch photo paper negative, and overall it stands about 35 cm tall. The disk on the front serves as the shutter. 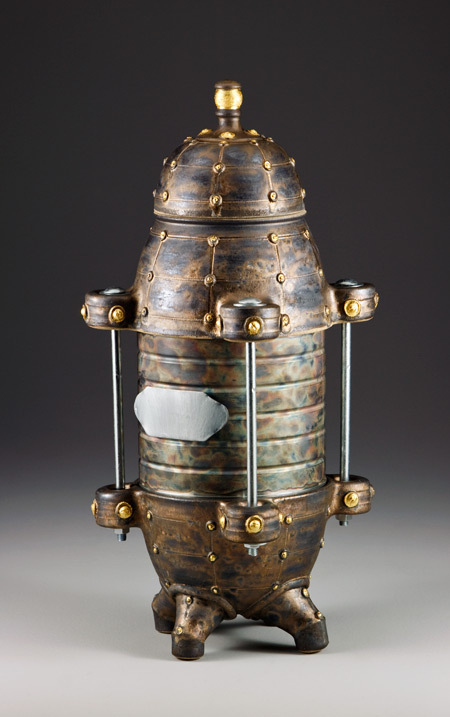 Here is a test image of a garden lantern made with this camera. This camera was completed in 2012. 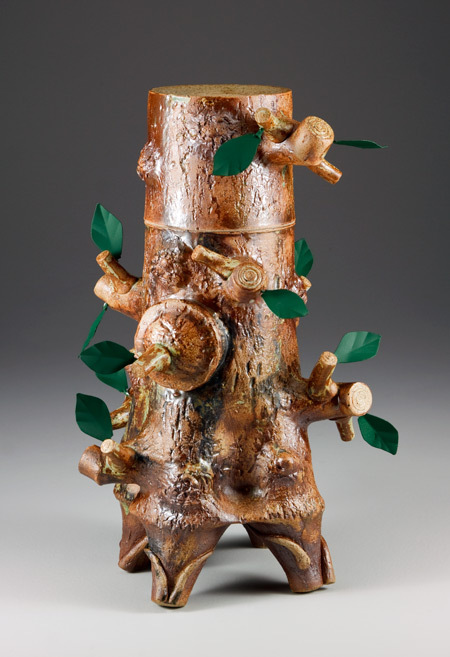 It's made of stoneware, fired to cone 10, with a post firing addition of steel leaves. I used a variety of glazes on the outside, and a matte black glaze on the inside. It uses a 5 x 8 inch photo paper negative, and the knot hole at the middle front serves as the shutter. The camera is 41 cm tall. This camera was completed in 2011. It's made of stoneware, fired to cone 10, with a matte copper glaze on the outside. A matte black glaze has been used on the inside. The disk on the front with the eye covers the pinhole opening to the camera, and is removed to expose the negative. The camera uses a 4 x 5 inch photo paper negative, and overall it stands about 25 cm tall. This camera was completed in 2011. 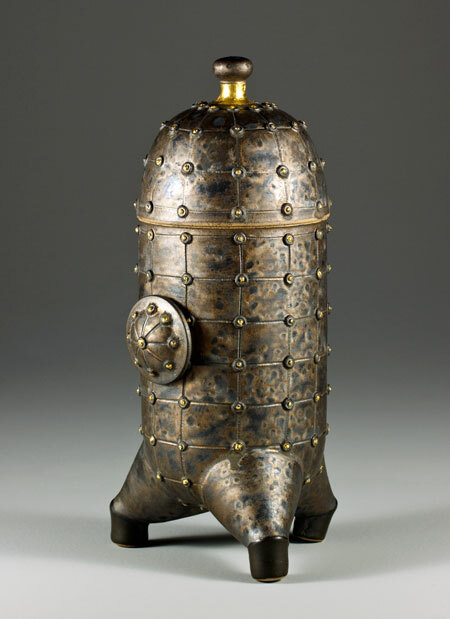 It's made of stoneware, fired to cone 10, with a post firing application of 23k gold leaf. I used a bronzy, metallic looking glaze on the outside, and a matte black glaze on the inside. It uses a 5 x 8 inch photo paper negative. The camera is 30 cm tall. Here is a test image of a horse skull made with this camera. This camera was completed in 2008. 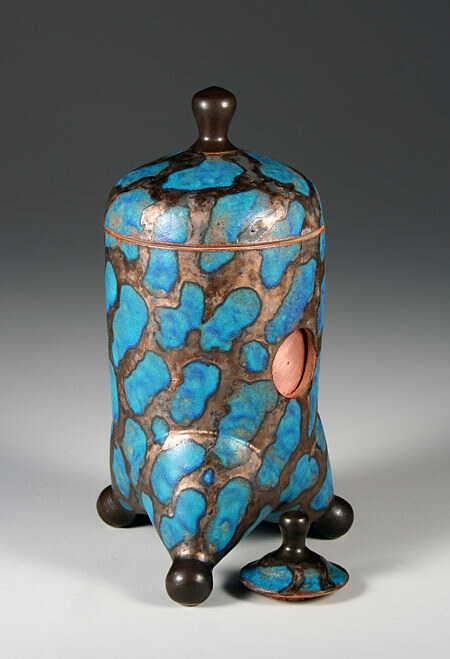 It's made of stoneware, fired to cone 10, with copper glazes on the outside. 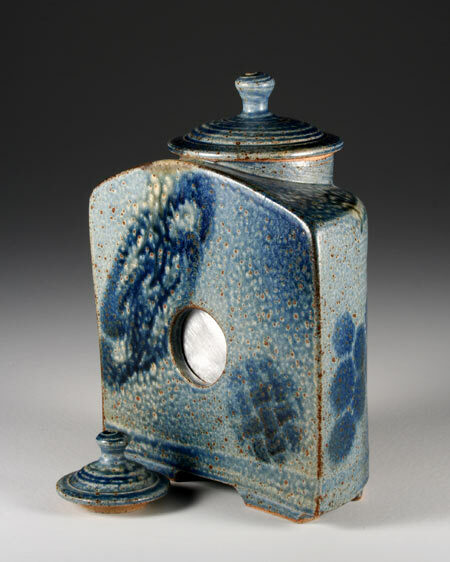 The same black glaze has been used on the inside as has been used on the feet and knobs. A thin sheet of copper metal has been used for the pinhole disk. The camera uses a 5 x 8 inch photo paper negative, and overall it stands 29 cm tall. This camera was completed in 2007. 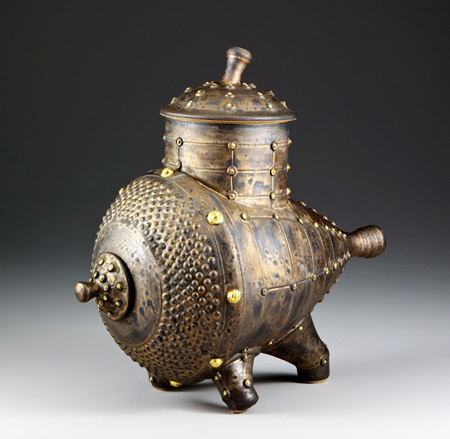 It's made of stoneware, fired to cone 10, with a post firing application of 23k gold leaf. It uses a 4 x 5 inch photo paper negative. The camera is 22 cm tall. 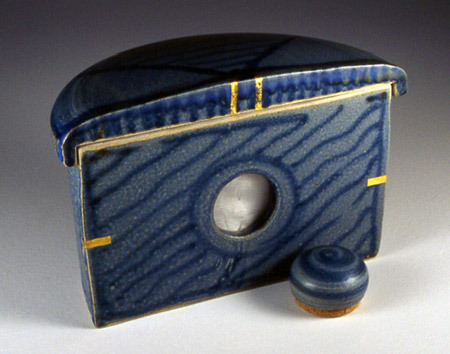 This is another ceramic box camera which uses a 4 x 5 inch negative. 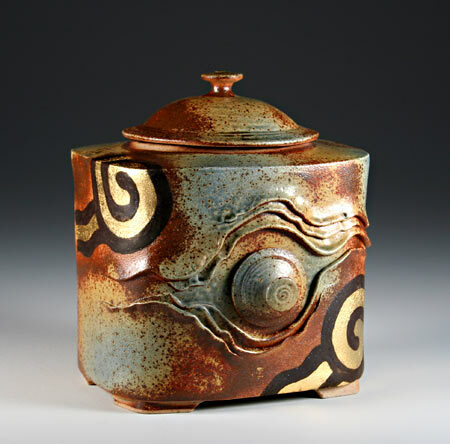 It has a combination of sprayed glazes on the outside. All of the ceramic cameras have a matte black glaze on the inside. I like the organic look of these cameras which contrasts with our usual notions of cameras being machine-made, high tech devices. This camera is 21.5 cm tall. This camera is basically a thrown jar that has been cut in half, with a slab attached to the open side. It uses a 5 x 8 inch negative. It has a cobalt decoration that has been sprayed through stencils. This camera is 23.7 cm tall. This is one of the earlier ceramic cameras, but it is one of my favourites, and most often used. Similar in design to the camera shown above, but with a more open curve to the body. It uses a 5 x 8 inch photo paper negative. This camera is 18 cm tall. I have a small (one meter square!) darkroom in my home where I develop the negatives.